The Gold Gods, the industry-leading street culture jewelry and accessories brand, is proud to announce its first ever College tour entitled Gold Gods On Campus. In partnership with select universities, Gold Gods On Campus features The Gold Gods brand visiting a variety of colleges and producing mini events for students consisting of unique games, exclusive giveaways, special offers, and a custom VR experience. Integrating with existing college campus activities, The Gold Gods is bringing a taste of urban streetwear culture to universities beginning on the west coast in August and September. For more information about The Gold Gods, or for more information about Gold Gods On Campus, please visit http://www.thegoldgods.com. The Gold Gods (http://www.thegoldgods.com) is a leading jewelry and accessories brand tailored towards the urban street culture lifestyle. Founded in 2013 in Kansas City, MO, the lifestyle brand combines unique designs with quality craftsmanship to deliver premium trendsetting products. 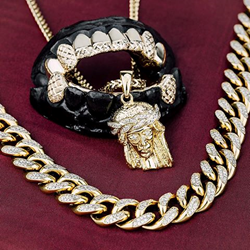 The Gold Gods is the top retail-selling urban jewelry line in North America distributed in more than 800 stores, as well as online worldwide. The Gold Gods flagship retail store is located at 450 N. Fairfax Avenue in Los Angeles, California.